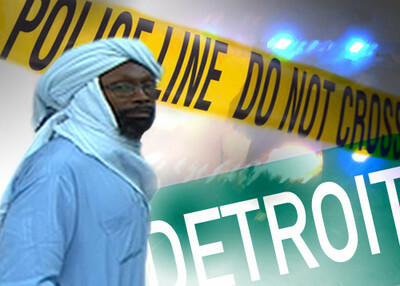 The imam had driven from Detroit to northern Virginia to raise money for a jailed friend, a convicted cop killer. "If you study the case you'll see that it's a conspiracy," the imam said. "If you study what went on with him, you'll say, 'How in the world is he in jail?'" According to the FBI, Abdullah led a separatist movement which wanted "a separate, sovereign Islamic state ('The Ummah') within the borders of the United States, governed by Shariah law. The Ummah is to be ruled over by Jamil Abdullah Al-Amin, formerly known as H. Rapp Brown." "How much can we sacrifice in order to see Imam Jamil released? If we could sacrifice our lives, would we?" "This tragic shooting raises deep concerns regarding the use of lethal force by law enforcement agents." An FBI statement said agents considered the suspects to be armed and dangerous, and "special safeguards" were employed to try to make the arrests peacefully. The complaint contains repeated references to Abdullah's instructions that his followers stay armed and his vow not to be taken by law enforcement. An FBI dog was killed in the shootout that resulted. The MANA statement said allegations in the complaint were "shocking and inconsistent" with what they knew about Abdullah. It also stressed that the charges involved regular criminal activity and should not be used "in order demonize American Muslims." Abdullah did not share that sensitivity when it came to the conspiracy theories he preached against America. According to the complaint, he threatened "straight up war" if the FBI came after him. He also believed the FBI was behind the 1993 World Trade Center bombing and the Oklahoma City bombing. They were "part of a plot to blame Muslims for violence." Similarly, he told the 2008 ADAMS Center audience that Jamil Al-Amin was better off not "to be out here on the street when they drive planes into the World Trade Center –whoever did it. Whoever did." According to the complaint, Abdullah repeatedly preached a confrontational brand of Islam that advocated the spread of the religion through violent jihad. He also kept weapons in his mosque, used it for martial arts training and was recorded saying it would be a good place from which to sell stolen goods. In an interview on WDET-FM in Detroit, CAIR's Michigan Executive Director Dawud Walid said the emphasis on Islam could trigger a backlash against other Muslims and contribute to Islamophobia. The ADC's Michigan Regional Director Imad Hamad expressed similar concerns on the same program. Both men indicated that they expressed their concerns to the FBI. The pressure appeared to take root. At a news conference Thursday, U.S. Attorney Terrence Berg made a point of asking "people not to connect the group, headed by Luqman Ameen Abdullah, with Muslims in general. Abdullah, 53, was killed in a shootout with FBI agents Wednesday at a Dearborn warehouse. Berg said the group in question 'is a specific brand of radical ideology.'" Islamic groups want to use the case to resurrect a simmering debate on the FBI's use of informants, especially those who enter mosques as part of the investigation. ADC's Hamad told the Detroit Free Press that: "The case – regardless of the facts, regardless of the allegations, regardless of what went right and what went wrong – brings back that issue of informants." Walid also stoked the issue, telling the Free Press "As much as our president says nice, flowery things about Muslims and Islam in Cairo or Istanbul, these types of stories just erode that." Walid has said he had considered Abdullah to be a respected imam and that "We have no information about illegal activity going on at that mosque." Mujahid Carswell, Abdullah's son, was arrested in Windsor, Canada Thursday. Two other defendants in the case remain at large. The men are charged with conspiring to sell stolen goods, violating weapon laws and other crimes. The Washington Times reports that federal officials warn that Abdullah's death may generate retaliation by radical sympathizers against law enforcement officials. Re: Your article on Detroit Imam Luqman Ameen Abdullah, the FBI shooting of the Imam and the Islamic community's attempt to separate this from the mainstream Muslim community. The real name of the Movement that Imam Abdullah was involved in is not the "Ummah" but the Dar ul Islam movement. It was founded in the early 1960's in a mosque in Brooklyn, New York It was an allianace between Orthodox African American Muslim clergy and Middle Eastern Clergy. In 1968 Dar ul Islam started a Prison discipleship program with the goal of establishing a Sunni mosque in each one of the state Prisons. In the FBI complaint on Imam Abdullah, the Agent states that many of Mr Abdullah's followers were inmates or ex-inmates from throughout the United States. Once more we see an example of the fruits of Islamic radicalization in the Correctional environment. This is not the first incident involving violence or weapons for the members of the Ummah or Dar ul Islam Movement. . In January 1973 four members of the Movement stormed into John & Al's Sporting Goods Store in New York City in an attempt to procur weapons for a Radical Islamic uprising. The seige lasted 2 days before the hostages were released. During the gun battle, one NYPD Officer was killed. All four of the members of the Movement were arrested and sentenced to lengthy prison terms. In prison they continued to preach the doctrine of the Movement, which was an independent Islamic State separate from the United States Goverment. The spiritual leader of the Movement is Jamil al Amin formerly known as H Rap Brown, himself a former New York State inmate and leader of the Black Panther Party. He is currently serving a life sentence in the Federal Super Max Prison in Florence, CO. for the shooting deaths of two policement. The Ummah or Dar ul Islam Movement has a long history of violence against authority and involvment in criminal activity in the name of Allah.